Five turned out to be the maximum number of chocolate shops I could tolerate in the end. A few others were on the back of my list the day I set out with a friend to eat truffles in New York, but we hit our chocolate ceiling by the fifth stop. We started at Mast Brothers Chocolate in Brooklyn, New York City's only bean-to-bar operation. A display table showing off piles of solid, single-origin bars also held four plates of broken pieces of chocolate to sample. And though our mission was truffles, we started with the pure chocolate. One chocolate from Madagascar was absolutely stunning, with prominent raspberry notes, like a fruit-forward wine. 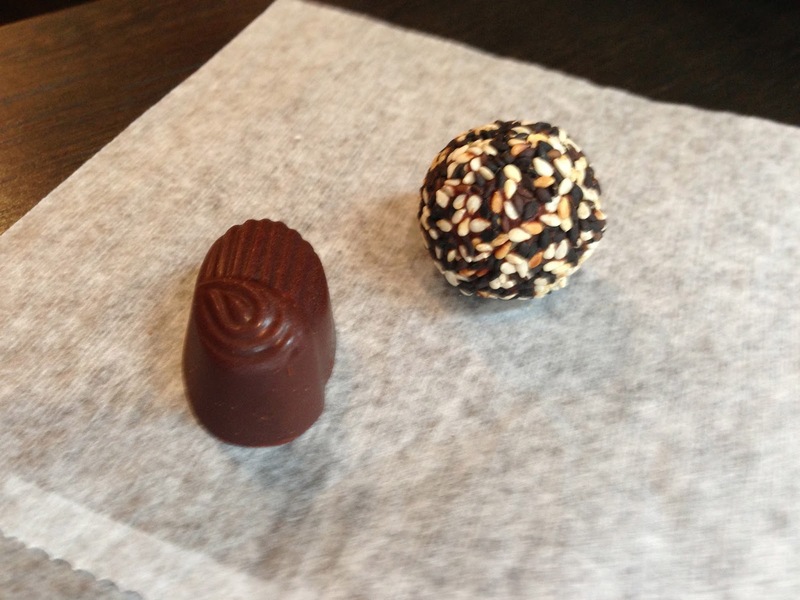 At the counter, we found truffles and bon-bons, so we picked up one banana caramel bon-bon and one dark chocolate truffle rolled in confectioner's sugar ($2 each). The bon-bon had a soft caramel center flavored with what tasted like true banana, no imitations and flavorings here. As for the truffle, my friend, who's more of a truffle expert than I am, says she looks for a delicate shell and the right texture inside, this one was high quality in both areas. We hopped on our bikes and pedaled over the Williamsburg Bridge, burning a few calories along the way, and parked outside Essex Street Market, where inside we'd find our second shop. Roni-Sue specializes in bacon-chocolate creations, but also has an interesting line of cocktail-inspired truffles, including a Manhattan (bourbon, sweet Vermouth, and cherry), which tasted uniquely sour in contrast with the sweetness of the chocolate. Another stellar creation was a beer caramel, covered in chocolate and topped with pretzel pieces. The most basic and classic truffle, in this case called "chocolate cake" tasted dry and uninspiring. 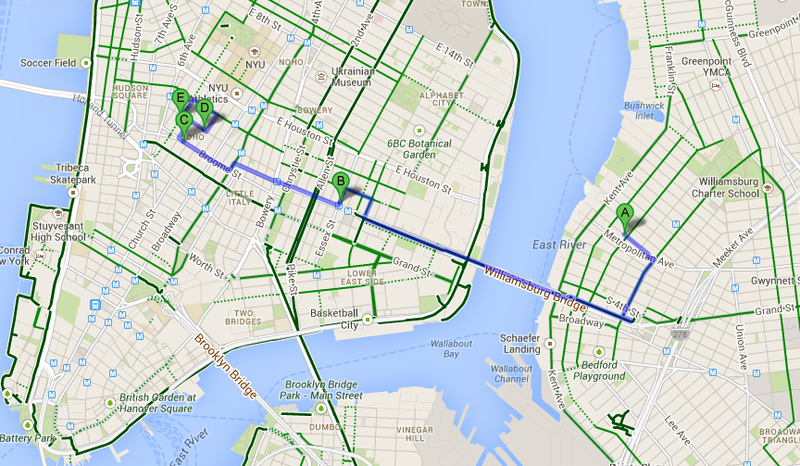 Back on the bikes, we winded our way up to Soho, where we intended to hit at least three more chocolate shops. Marie-Belle Chocolate in New York. MarieBelle takes image seriously. 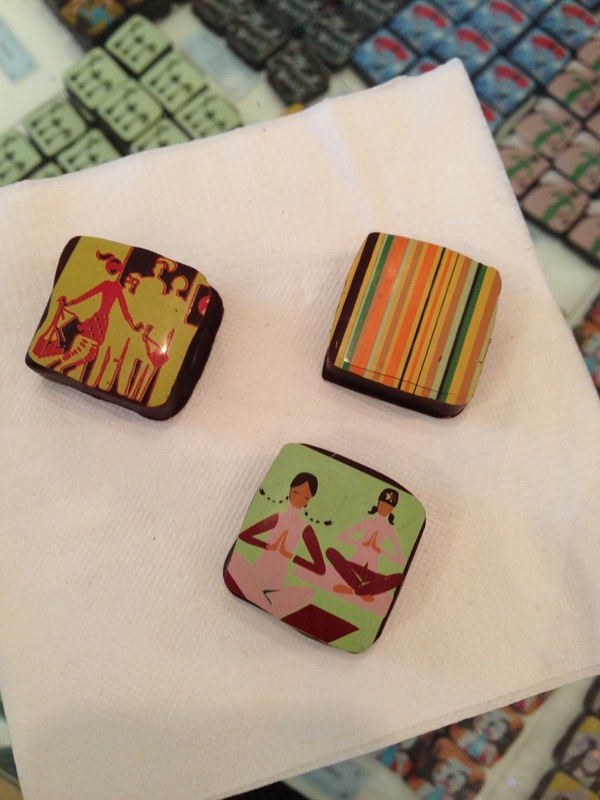 The first images of painted chocolates on this page are from this haute chocolate shop in Soho on Broome Street in New York. It's intimidating. A chandelier hangs in the middle of the room, and the walls are hand-painted blue and gold (one wall has an intricate painted pattern; not shown). The selection is also intense with dozens upon dozens of flavors. We chose a few more off-beat flavors: banana (to compare it with Mast Brothers), lavender, and sesame. The sesame was disappointing, with only a hint of warmth and texture, but no real flavor of sesame coming through. The banana tasted artificial in contrast with our banana caramel from earlier in the day. 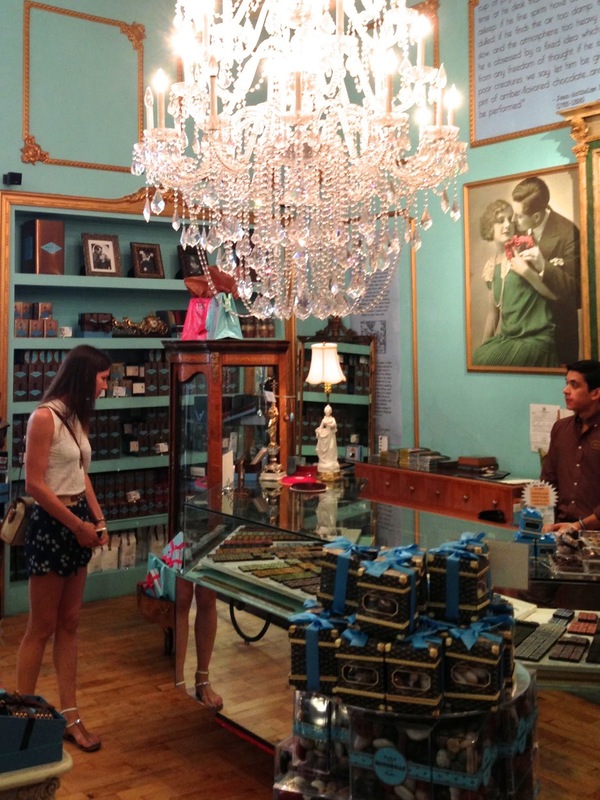 But I'll sing praises for the lavender chocolate: quintessentially French. By the time we arrived at Voges, just around the corner on Spring Street, I was already started to feel sugar overload. My friend and I had been sharing the chocolates, eating only half of a truffle or bon-bon each, but it adds up fast. We were turning down free samples at this point, and struggling to choose new truffles. Should we do more comparative tasting and stick with flavors we already had, or go in a new direction. I caved at Voges and picked a seasonal limited edition "Italiano" that was flavored with balsamic vinegar and roasted hazelnuts, lovely and subtle. For our second truffle at Voges, we opted for coconut, in part because it was offered as a free sample and we just couldn't keep turning them down. It had a strong coconut flavor and lots of sweetened shredded flakes on top, which is fine by me. 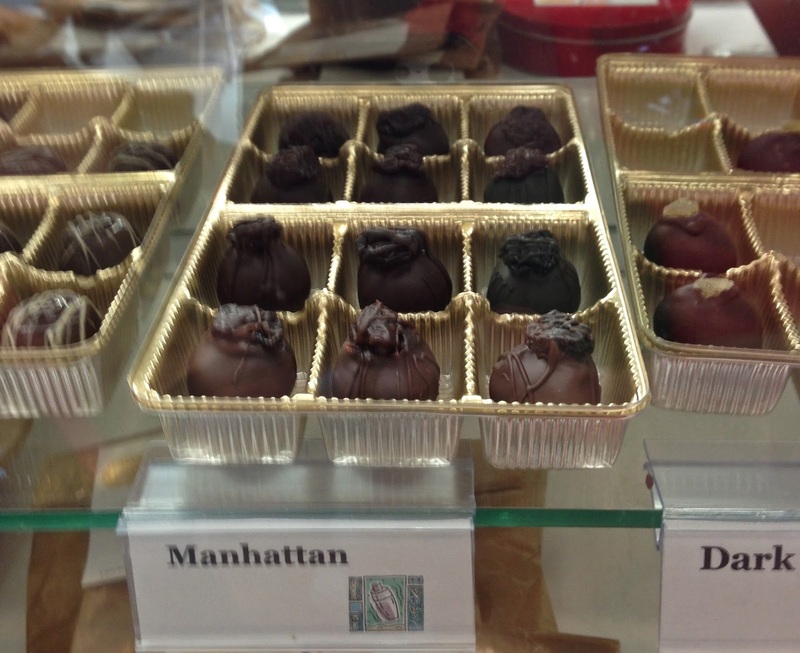 at Kee's Chocolates in New York. Last up: Kee's Chocolates, and intentionally last on the list. We didn't mean to eat so many truffles at Kee's, but once again, the free samples started coming and, well, it would have been rude to turn them down. The flavor combinations of Kee's truffles range from standard to exotic, and the only one I was dead set on trying was black sesame because it was a truffle literally rolled in black and white sesame seeds, and the texture combinations was like nothing I'd ever tasted before, the pop of the sesame seends and their delicate crunch, the melt-away quality of the chocolate... Another irrestiable truffle was honey saffron, which turned out to be overpoweringly sweet after all the chocolates we had eaten that day. Ginger was the free sample, and a final blood orange truffle hit all the right notes with its quiet fruitiness without a strong citrus punch. I'm a writer covering technology, as well as topics in lifestyle and travel. Though I still call New York home, I'm currently living in Bucharest, Romania. Read more about me or contact me.